Chopsticks are simple in design yet offer a powerful tool for delivering food from plate to mouth. Better than a fork? Well, I don’t want to be viewed as a traitor … but I must admit, once you get the hang of chopsticks you might just see how they are a better device. I prefer chopsticks since they are easy to clean — no difficult fork tines to deal with here. You can use them to stir, cut food, serve food, and of course eat food. And, for those you are just kids at heart, by sticking them under your upper lip you can make amazing walrus impersonations. So, are there really so many types of chopsticks that a chopstick buying guide is necessary? After finding so many chopstick choices (and having made a few bad choices), I decided it might be helpful to those curious about selecting the perfect utensil. First, consider the material from which the chopstick is made. 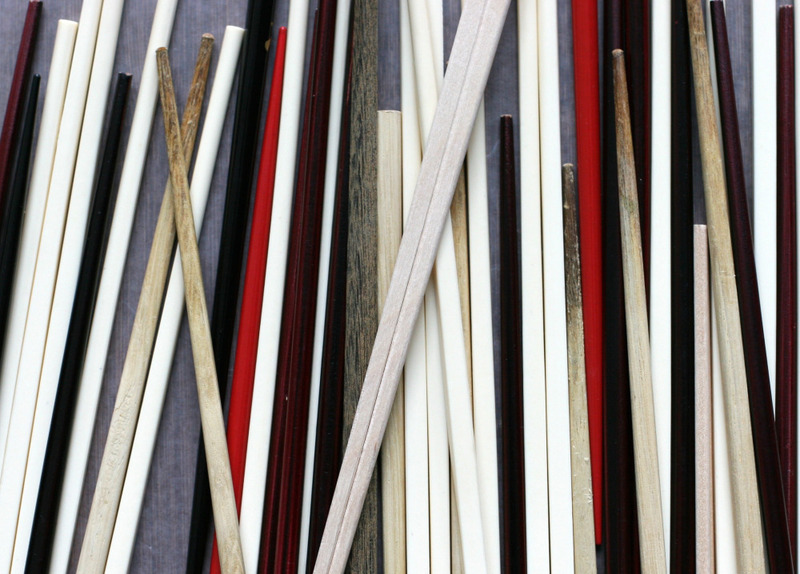 You’ll usually find three common materials used to make chopsticks: wood, plastic, and stainless steel. are often sealed with a shiny laminate which can create a slippery surface. While the chopsticks are often beautifully decorated and colorful, I find these to be the most difficult to use. Also, as the laminate wears away, the wood will become more permeable and can become harder to clean. Of course, you can also buy the disposable wooden chopsticks for super-quick clean up and to create a true ‘take out’ experience at home. are akin to stainless steel dinnerware, often viewed as the ‘good silverware’. Although easy to clean and sanitize, metal chopsticks can be heavier and can absorb heat quickly. Plastic chopsticks are reminiscent of Chinese restaurants but there’s something to be said for this. Restaurants know how easy these chopsticks are to clean and use. My preference is actually for this type and find that these are the ones I use on a daily basis. Plastic chopsticks can be found in most asian grocery stores or from restaurant supply companies. Just as chopsticks come in several different material types, the shape of a chopstick is likewise important. You’ll notice that the tip of the chopstick may be either pointy or rounded with a blunt end. While pointy tips are intended for picking up the smallest grain of rice, I find the shape less practical when eating slices of slippery meat or vegetables. A rounded tip allows you to easily grasp (and hold onto), foods of all shapes and sizes. The body of the chopstick is also variable, ranging from fully rounded to squared. The more square the body, the easier it is to grip the chopstick. Chopsticks with rounded bodies can roll between the fingers making it difficult to pick up food without the chopstick slipping. My preference is for the squared chopstick design. For those new to chopstick usage, have no fear. You may feel clumsy using chopsticks at first but with practice chopsticks will become easy to use. , also known as ‘cheater chopsticks’, are a great way to learn chopstick mechanics while still being able to get food to your mouth. Training chopsticks come as either a single chopstick unit with a closed end or as a chopstick holder which you can attach to any chopsticks. The designs come in fun shapes and colors with some made especially for children. Chopsticks are a space saver and don’t take up as much room as western silverware. You don’t need any special drawer inserts and don’t need to worry about separating dinner forks from salad forks. I keep mine in a glass stored on a shelf. It allows for easy access and takes up little space. I’ve gotten rid of many chopsticks that were difficult to use due to their material or shape. Currently, I have about 25 pairs of chopsticks which is likely more than enough for a household of two. However, I have the urge to buy more. Excellent post. I’ve learnt a lot. Thank you. And don’t forget the “cooking chopsticks” – a sturdier pair (wood, not plastic or metal!) that are used for cooking, stir-fries, etc. Often burned, scarred, etc, they do duty by the stove. Thanks for this very informative post. I’ve been wanting to buy a good set of chopsticks and had no clue that there were so many variations to them. I’d eat every meal with chopsticks if I thought I could get away with it. I like them so much better than forks! great post! however, i wouldn’t encourage the use of disposable wooden chopsticks. they are treated with bleach and no one should be eating from them! I have been washing forks for the better part of 50 years. In the grand scheme of life’s challenges, cleaning between the tines of a fork is pretty low on the list. I agree there are many benefits to using chopsticks. But I think you’re stretching a tad with that argument! What an interesting post! I’d never really put much thought into which chopstick would be easiest to use. I believe that chopsticks with the tapered and pointed end are Japanese chopsticks, while chopsticks with a thick and blunt end are Chinese. I could be wrong but it’s something I heard a while back. -the pretty cheap wooden ones with lovely designs are nice for a period but the paint chips and the idea of an imported product chipping into my food is kinda gross. -by far the worst i’ve tried have been metal. the colden stainless steel in mouth should only happen at the dentist’s office. easiest to clean though. -my favorite at the moment are square, wooden, unpainted. yes, the laminate on them smelled funky in the beginning but has since worn off considerably. i like the warmth of them w/food, paint doesn’t chip in the dishwasher, and they don’t hold any odors. i’d like to find an organic wooden brand that can guarantee there aren’t any funky laminate chemicals on there. Excellent post. Never paid much thought to chopsticks until now! I love chopsticks. SO MUCH. You might mention that the nice laquered wooden ones (they really last a long time if you take care to hand-wash gently), and often plastic ones too, often have little ridges on the tip to keep food from slipping– these are great for intermediate chopstick users, or anyone at all eating something with a smooth sauce! where that distance is direct, not tracing the angle, so the third side of the triangle your outstretched thumb and forefinger would make. I couldn’t find a website in English very easily, but this Japanese site has an easy calculator, plus instructions with visuals that bridge the language gap pretty well, I thought! : http://homepage2.nifty.com/r2o/chopstick.html (the little round button that says 計算 is “calculate”). Now I need to pick up a pair of cooking chopsticks… they’re the best! As for the slipperiness of the Japanese, tapered, sticks they make ones with lines engraved into the surface to minimize that problem. I took the same photo of my sticks at home! I have too many pairs to count but have 1 or 2 favorites that I use on a regular basis. Actually you forgot the flat chopstick. Most Korean metal chopsticks used at home are a flat rectangular shape with designs stamped into the base. The restaurant version is the hollow rounded stainless steel. We have a few pairs here but for some reason never use them. I guess we like to eat really quickly! I don’t like opening up disposable wood ones – I feel like I have to know if they are made from sustainable materials first (or better yet, not have any waste at all).